To start from the very beginning, the first towards pregnancy happens when the fertilization of an egg is done by the sperm. In the instances where conception is done naturally, around the time of ovulations, within the fallopian tube, fertilization is done. Afterwards, the fertilized egg (which has become an embryo by now) travels through the fallopian tube and reaches the uterus. The uterus is now prepared for the growth and development of the embryo. This whole process takes about a week to happen. In case of In Vitro Fertilization, the fertilization happens outside of the body. Following a few days, the embryo is moved into the uterus by the doctors. There it shall ideally embed and develop. In both the cases i.e. the case of natural conception and IVF, it is important for the embryo to get hatched before getting embedded inside the womb. To effectively incubate, the embryo must unexpectedly burst through its external layer, called the Zona Pellucida. The process begins after 3 days of fertilization. After the time when embryo gets a couple of days for developing. In this process of assisted hatching, the zona pellucida, covering the foetus, either become thin, or just get ruptured. Often, an acidic blend is used to break down the Zona Pellucida. Apart from this, sometimes, a needle or laser might be used to tear open the outermost layer of Zona Pellucida. To complete this, a micromanipulation system requiring the utilization of tiny apparatuses, mechanical help, and a magnifying lens (to see the developing embryo), are required. 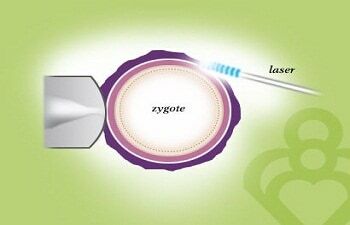 Embryo can be moved to uterus just after one day of hatching if you utilize the IVF with laser assisted hatching. To lessen the danger of intricacies, antibiotics and steroids should be controlled as they can once in a while cause reactions/ side effects. As mentioned above, the process of hatching is a mandatory requirement for all the pregnancies and births. Be that as it may, not every embryo is able to hatch on its own. In such cases, the process of assisted hatching comes to aid. The process is most helpful for females who are over the age of 38, or the ones who have faced at least 2 IVF treatments that were not successful. For cases where the embryo of a couple is in faulty condition, such as the outer wall is very thick, assisted hatching might also be prescribed for boosting up the success rate of pregnancy. ⟵Are there any signs I can check as a teen to check my fertility?